One of the advantages (or is it a pitfall?) of being a GoodReads member is that I feel some obligation to explain why I rate the books I read and so I find myself being more "aware" of my reading and trying to articulate why something appeals to me, why something doesn't. This doesn't necessarily extend to books I've read in the past and am adding but it certainly does to anything I've read since joining. I don't mind it so much when someone rates a book a 3 or 4 or 5 stars. They liked it; if I know or have heard of the author and/or the blurb sounds intriguing, I can add the book or ignore it as I wish. I do have a (perhaps perverse) desire to know why someone gives a book a 1 or 2, however. What was bad about it? Why should I avoid it? 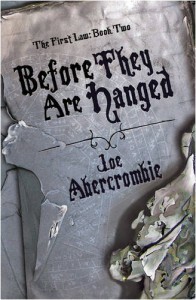 What does this have to do with Joe Abercrombie's second book in the First Law series? Not a heck of a lot really. I still find Abercrombie's writing engaging and am looking forward to finishing up with Last Argument of Kings but I don't want to give a "final review" until I've done so. There! That's the connection: I'm not shirking my reviewing responsibilities but I can't give this author a fair shake until I've read the entire opus.